To begin this project of course we have to start where it all began. The first full length animated film- Snow White and the Seven Dwarfs. 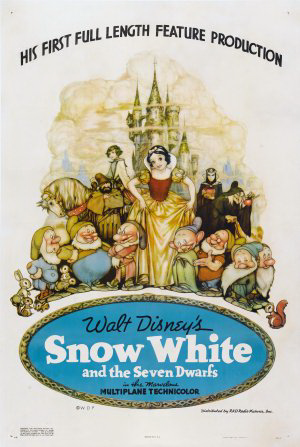 Debuting in 1937, Snow White was not only a creative success but a commercial hit as well. Earning $8 million dollars in its initial release, making it the highest grossing film at the time. Walt Disney was given an honorary Oscar in 1939 for his achievement and the 7 Dwarfs became marketing icons on all kinds of merchandise, creating a commercial profitability which film had not seen to that point. Work on the film began in 1934 with an initial budget of 250k. For a time it was called ‘Disney’s folly’ because Walt had to mortgage his house and ran up a cost of nearly 1.5 million to produce.